This stunning land for sale in Bali possibly the most Exotic land for sale in Canggu Bali, a Spectacular Property for sale in Canggu Bali. Offering Gorgeous Rice fields view this Excellent block of land in Canggu is one of our featured land sale in Canggu Bali listed on our Canggu property listings. Strategically located in Batu Bolong, Canggu Echo Beach Bali, this Rice fields view Amazing land in Canggu Bali for sale is suitable for villa / apartment / residential. 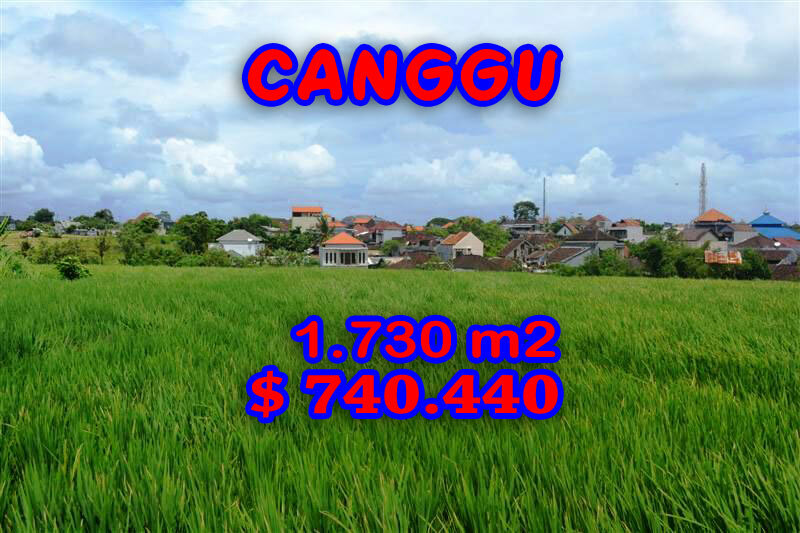 Very Reasonable price USD 428 / m2 which considered very cheap compared to other Canggu land for sale this Magnificent land in Bali for sale in Canggu is a Golden opportunity for Property investment in Bali, Indonesia. Bellow are the specs and the the features of this Relatively Cheap 1.730 m2 Astounding land for sale in Bali. This Attractive land for sale in Canggu Bali 1.730 sqm in CangguEchoBeach is one our best offer of Outstanding land in Canggu for sale featured on our listings of property for sale in Canggu Bali, one of the most Fantastic property in Bali available for sale on current Bali property market. This Fabulous property for sale in Bali, 1.730 m2 land for sale in Canggu Bali is proudly offered by Bali Real Property, a group of honestly native, legally competent Bali property & real estate professionals specialized in Exceptional property and land for sale in Bali with honest and the most reasonable price. Canggu is a very astonishing place of interest in Bali. With the Exotic rice fields view in cozy surroundings, Canggu is an ideal place to start and end each day by making Canggu your base to experience and explore the real Bali, the Amazing nature beauty, traditions, its unique culture in warm and charming society. The perfect peaceful escape from the over developed and bustling, even manic areas of Kuta and Seminyak. As one of our specialized area we offer wide selection of Wonderful land in Bali for sale in Canggu that great for private house, commercial villa or for a prospective property investment in Bali that offer a quick beneficial return . Land for sale in Umalas Canggu, land for sale close to the beach or with ocean view in Brawa, Cemagi Mangening and Echo Beach, land for sale with Exceptional rice fields / paddy view or river side in Canggu Pererenan, Land in Canggu Good for villa in Canggu Tiying Tutul and Kayu Tulang, Batu Bolong, Peti Tenget and land in Canggu for sale near the prestigious Cunggu Club. This Fantastic land in CangguEchoBeach is one of the most Magnificent land for sale in Bali on our Bali property listings, perhaps one of the most Exotic Property for sale in Bali. Beside this Gorgeous 1.730 m2 land in Bali for sale in Canggu we do offer a wide selection of other Beautiful Property / land in Bali available for sale with the most reasonable price in all Bali Prime locations.